And here we have pound 3 of the 20 pound bread flour project. Again I didn't count the flour in the preferment otherwise this would be a pound and a half to figure in, and I'm staying with round numbers. At least I'm cheating myself out of an early finish and not cheating the system. Again I used Alton Brown's basic bread recipe, regular bread flour for the preferment, and for the main dough I used 10 oz high gluten bread flour and 6.5 oz wheat bread flour. I did a quick egg wash (what I call a scrambled egg wash, just crack open an egg and add a touch of water before blending with a fork) and some slashing. The dough was divided in half, one half made the large boule. The other half was again halved, part going for the hogie bun beside the large boule, the remaining being halved yet again to make essentially a roll and a brat bun. 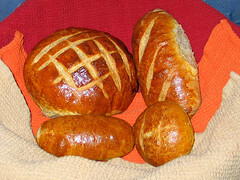 I now know that the recipe can make four hogie buns, or eight rolls or buns. Not bad for an evenings work. Tomorrows breakfast will be the taste test.